About 6 minutes and 38 seconds reading time for this 1.6K word page. If you havent read the report published by the Congressional Research Service CRS that was prepared for Members and Committees of Congress report number R44553 then you should. Ill be making many references to this report as well as others. I should say it by state, Louisiana, Texas, California, Peurto Rico, US Virgin Islands, Florida, .... we have a problem. By the end of this article we will be yelling at the top of our lungs, "Attention All US States and US Territories, we have a problem." The problem is how we recover from disasters, the current process we following, guidance ignored or followed in part, select individuals and groups that minipulate the system by filtered and selective process and procedure rule following. These issues cost disaster victims time and untold amounts of finanical losses to which no local, state or federal government tracks in any database or information collection method. Small Business Administration (SBA) Disaster Loan Program. Despite quality checks and audits, agencies continue to provide duplicative disaster assistance to individuals and businesses. Federal guidelines regarding the process that states may follow in an effort to minimize potential duplication of benefits in the awarding of CDBG-DR are advisory and are not mandated requirements. 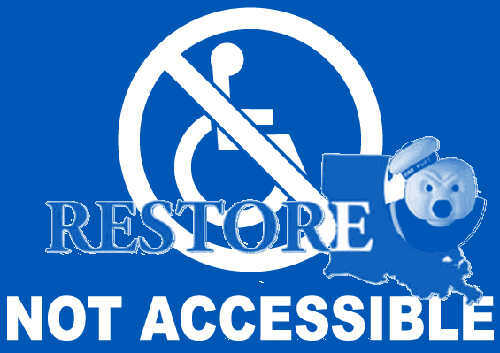 "To some this gives states too much flexibility to determine who is eligible for CDBG-DR."
HUD released early funds specifically to handle the most impacted parishes the state of Louisiana had reported. HUD identified six most impacted parishes from storms in March DR4263 and August DR4277. 5. Volunteer Agencies "Additional Assistance Programs. 4. FEMA Individuals and Households Program; and Other Needs Assistance Pursuant to Section 408 of the Stafford Act. 6. Volunteer Agencies "Additional Assistance Programs. An organization's position within the sequence determines the order in which it should provide assistance and what other resources need to be considered before that assistance is provided. Further, each organization is responsible for delivering assistance without regard to duplication later in the sequence. 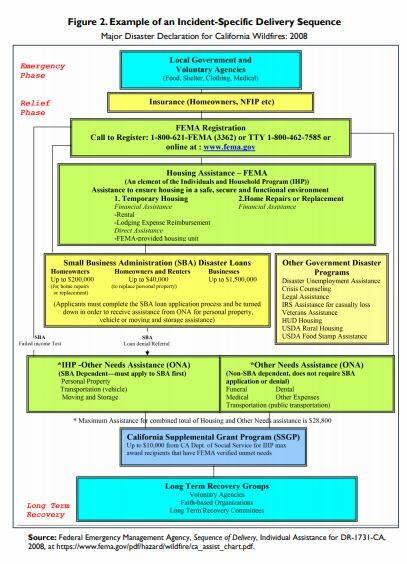 According to FEMA regulations, the agency or organization that is lower in the delivery sequence should not provide assistance that duplicates assistance provided by an agency or organization higher in the sequence. When the delivery sequence has been disrupted, the disrupting agency is responsible for rectifying the duplication. 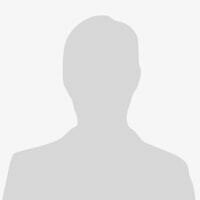 Why your SBA Loan will not be paid for by CDBG-DR Grants. FEMA regulations assign the order to which disaster assistance is to be delivered. A lower level agencies funds can not be used to pay a higher agencies funds. Funds that HUD uses for CDBG Grants can not be used to pay off or pay down SBA Loans due to the sequence of delivery FEMA has in place. If SBA loans were paid down by CDBG-DR grant money it would be adding to the taxpayers burden as well as reducing the available grant money for disaster victims that did not qualify for SBA disaster loans. FEMA considers CDBG-DR as "Other Governmental Assistance" that follows SBA loans for disaster recovery. Figure 2 offers a more comprehensive delivery sequence that has been developed for certain incidents. This is from California during their wildfires in 2008. As mentioned previously, a key issue of congressional concern has been the duplication of benefits between the SBA Disaster Loan Program and CDBG-DR. 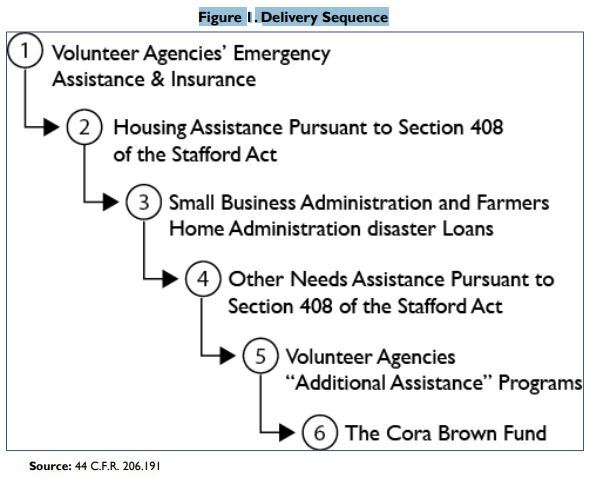 The concern stems primarily from (1) how federal agencies interpret duplication of benefit policies, and (2) how states have made CDBG-DR decisions based on whether disaster victims received a SBA disaster loan. The SBA OIG concluded the SBA's controls to prevent duplication of benefits with CDBG-DR were adequately designed and working as intended. The SBA OIG noted however, that the recommendations from the earlier audits were primarily geared toward having SBA, in coordination with HUD and FEMA, develop agreements and roles consistent with sequence of delivery outlined in 44 C.F.R. 206.191. Rather than the SBA, it was HUD that took the initiative and issued the November 16, 2011, Federal Register Notice discussed earlier in this report (see Table 1). Based on the findings, the SBA OIG stated that there were no reportable conditions or recommendations. As mentioned previously, on November 16, 2011, HUD published a Notice in the Federal Register intended to provide guidance regarding the framework and processes to be used by state and local government grantees of CDBG-DR funding in determining if a duplication of benefits has and potentially may occur. The Notice neither prescribes nor mandates the specific processes to be used by state and local government grantees in identifying potential duplication of benefits. However, the sequence outlined in the notice is consistent with guidelines outlined in the Stafford Act, and FEMA and SBA regulations and guidance documents. Most importantly, the Notice was intended to clarify duplication of benefits requirements in an effort to ensure consistency in the use of CDBG-DR funds in compliance with the Stafford Act. The duplication of benefits requirements outlined in the Notice were intended to apply to active CDBG-DR grants dating back to 2001, as well as to future CDBG-DR grant allocations. Avoiding a duplication of benefits in the awarding of CDBG-DR funds is complicated by a number of factors. One area of concern has been the implementation and timing of the delivery sequence. For example, following Hurricane Sandy, which hit the east coast of the United States in late October 2012, homeowners whose homes were damaged by the storm were advised to apply to the SBA for a low interest disaster loan to repair their homes. Subsequently, these homeowners were later informed that they were ineligible for CDBG-DR grant funds under the New York City Build It Back program because the receipt of a SBA loan constitutes a duplication of benefits as articulated in FEMA regulations and the CDBG-DR guidance document published on November 16, 2011. In the case of CDBG-DR funds used to establish the New York City Build It Back program in 2013, residents who initially were approved for SBA disaster loans were deemed ineligible to receive grants under the NYC Build It Back program even if the homeowner had not accepted the loan. For example, a homeowner approved for a $150,000 loan from the SBA, but who did not actually take it, would not be eligible for $150,000 worth of assistance from NYC Build it Back. Should NYC Build it Back determine that this homeowner, for example, needs additional repair assistance beyond the $150,000, SBA retains the right of first refusal and can determine whether or not a homeowner will receive this additional assistance. Affected homeowners complained that the policy prevented them from receiving the assistance needed to complete repairs of their storm-damaged homes and penalized those who refused the SBA loans in an effort to avoid additional debt during a time of hardship. At the urging of the New York congressional delegation, on July 25, 2013, HUD updated its policy guidance to allow greater flexibility for homeowners who originally rejected SBA disaster loan assistance. The guidance document focused exclusively on the question of whether CDBGDR grantees can assist households and businesses that have declined SBA assistance. The document allows grantees to award CDBG-DR funds to households and businesses that have declined SBA, but before doing so the grantee must analyze and document reasons SBA assistance was declined and identify why the provision of CDBG-DR assistance is necessary and reasonable.21 Prior to this arrangement, grantees were required to reduce CDBG-DR assistance by the amount of the homeowner's approved SBA disaster loan.